Join us on Friday, July 6, 2012 from 5:00p.m. until 9p.m. as we celebrate the July First Friday Art Walk. If you haven't had a chance to see the gallery, this would be a great time to check out our new look and our new offerings. Before you enter the gallery, don't forget to look up and notice the beautiful new mosaic adorning our storefront. The mosaic was created by one of our artists, Wendy Mandel McDaniel. Then come in and enjoy the latest works of art created by the rest of our diverse and talented artists, Jan Master, Estella Fransbergen, Marcia Myrick Siany, Deane Kellogg, and Ginny Bullard. 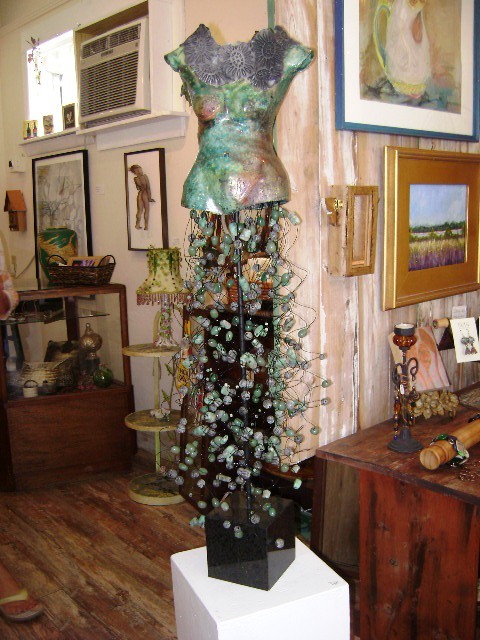 Jewelry, mosaics creations, pottery, sculptures, vintage finds, paintings, and mixed media collages are just a few of the art forms on display at Amiro Art & Found. Amiro Art & Found is located at 9C Aviles Street on the oldest street in the nation's oldest city. The gallery is open Thursday through Monday from 11:00a.m. to 5:00p.m. with extended hours on Friday and Saturday until 7:00p.m. Amiro is closed Tuesdays and Wednesdays. For more information, call the gallery at 904-824-8460.